Where did you get the idea for your business and why did you pick the name New York Couch Doctor? 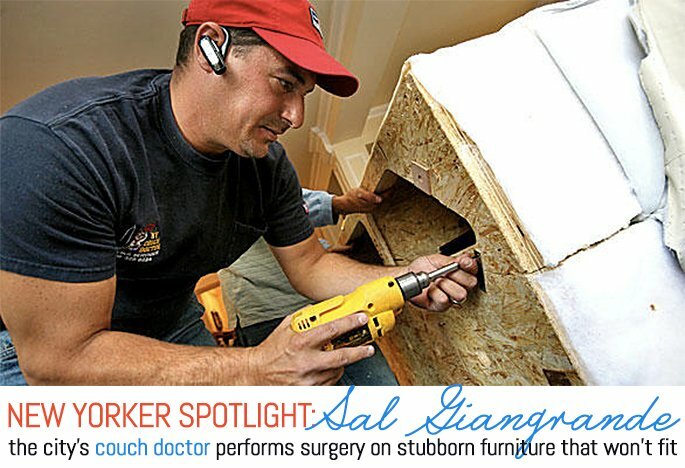 Sal: I used to deliver furniture and a common problem was the couch didn’t fit. As for the name, it’s pretty simple. New York is where it happens and couches are usually what I need to disassemble. It’s almost like surgery. Instead of cutting someone open, I’m cutting a couch open. Is there a reason couches are a common furniture problem in New York? Sal: It’s not the couch that’s the problem. Every apartment in New York City has one, but the trouble is trying to get it into the apartment. There are a lot of obstacles when delivering furniture: quirky turns, small elevators, narrow hallways, small doorways, walk-up buildings, narrow staircases with tight turns, and sprinkler heads. In most cases what I tell people is even if you go out and buy a new couch, if you are not extremely careful with measuring, you could theoretically run into the same problem twice. Do most customers call you before they move, or do many call when they’re in the process and get stuck? Sal: Both, but I enjoy more coming to the rescue when it’s moving day and it becomes, “Holy smoke, my couch doesn’t fit! What do I do? !” I try to explain to them that I understand the situation. It’s like getting a square peg in a round hole. I enjoy this more than those who call ahead because people are elated when they see me and the job is done. They have their couch where they want it, and it looks exactly the same as it did in their old apartment or in the showroom. What’s involved in disassembling and reassembling a couch? Sal: What is a couch? A couch is basically a frame that’s got two arms, a back, and a seat. In a nutshell, what I do is lift up the upholstery or leather off the frame of the sofa and we’ll get down to the frame of the couch. We’ll take apart the frame, whether it’s taking off an arm, taking off the back, taking off two arms, or cutting off the seat—or doing a combination of all of those things. We can do all of it. Wherever we make a cut, we put the wood back together with 1/2-inch thick steel mending plates and wood screws. What’s the most complicated disassembly and reassembly that you’ve come across? Sal: It’s hard to say. A lot of times custom-made furniture is more complicated than store-bought furniture. It’s more difficult to take apart. So, when considering buying a piece of furniture, do you have any tips? Sal: The thing that people should think about is the path that the furniture needs to travel through in order to reach its destination. It’s very hard to measure everything. There is so much to do that people don’t even bother. Most people will say, “Oh, I measured the wall and ok, I have 96 inches of wall space and the couch is 92 inches, it’s going to fit.” That’s really just a small piece of the puzzle. Sal: It’s gratifying when you come to somebody’s aide. It’s like being a good samaritan and you did something good for somebody. I’m doing the same thing in a business aspect. When people move and what’s fitting in one place gets to another and doesn’t fit, they’re unhappy. When I leave, they’re happy.